WASHINGTON – Known to millions for his trademark “Heeere’s Johnny” introduction as the longtime sidekick to Johnny Carson on “The Tonight Show,” entertainer and Catholic University of America alumnus Ed McMahon died early June 23 in Los Angeles at 86. The Detroit native, raised a Catholic but married three times, died shortly after midnight at the Ronald Reagan/UCLA Medical Center, according to a statement released by his publicist, Howard Bragman. Funeral arrangements were pending. No cause of death has been released, but in the past few years McMahon had endured a number of health problems, including a 2007 neck injury, and had a highly publicized hospitalization for pneumonia last winter. Though the entertainer publicly acknowledged recent financial difficulties that nearly forced him out of his lavish Beverly Hills home in 2008, he had been generous throughout the years with his time and money for Catholic institutions, including a scholarship endowment for Catholic University and serving as its alumni association’s national president from 1967 to 1971. McMahon’s celebrity status added excitement to alumni events, especially homecoming, said Marion Gosney, director of alumni relations at Catholic University. McMahon received a bachelor’s degree in drama from the Washington school in 1949 and was awarded an honorary doctor of communication arts degree in 1988. Edward Leo Peter McMahon Jr. was born in Detroit, attended the Jesuit-run Boston College, and served in the military as a test pilot during World War II before enrolling at Catholic University. 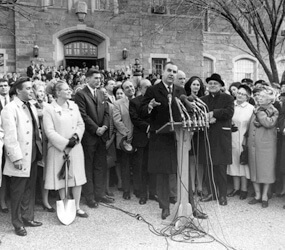 While enrolled at Catholic University under the GI Bill, McMahon studied under Dominican Father Gilbert V. Hartke – who created the drama department at the school – and later led the campaign to raise funds to build a theater on campus in the priest’s name. “Ed was devoted to … Father Hartke, only to follow in his footsteps to legend status. ‘I owe so much to CU,’ McMahon told me at Bob Hope’s funeral a few years ago,” Father O’Connell said. “That’s where my career got its start,” he told the priest. After stints on radio, McMahon shifted his attention to television in Philadelphia, and in the 1950s began appearing on a show called “Who Do You Trust?” hosted by Carson, and then accompanied the talk-show legend when he became the host of NBC’s “The Tonight Show” in 1962, where he remained until 1992, when Carson retired. The two men often joked with each other about their multiple marriages and divorces, and Carson also ribbed McMahon about his weight and alcohol consumption. In 1969 McMahon provided the narration for the Serra International Foundation’s film, “Generations of Influence,” produced to promote religious vocations. The longtime television personality is survived by his third wife, Pamela, and five of his six children. McMahon’s son, Michael, died in 1995.